This is a book for students of horticulture, home gardeners through to professional horticulturists; nurserymen, seedsmen, garden managers,landscapers or cut flower growers. 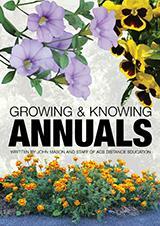 With 140 pages and beautiful colour photographs, Knowing and Growing Annuals is a must read for anyone interested in gardening. Origin: Europe and <st1:place w:st="on">Asia (mainly alpine regions). Appearance: Fern-like foliage.Annual species have red, solitary, terminal anemone-like flowers. 1. Full shade. Moist, light, cool, acid, humus-rich soil. 2. Partial shade. Moist, however well-drained, humus-rich soil. 3. Full sun. Well-drained, humus-rich soil. Uses: Cottage/informal gardens also wildflower meadows and gardens. Medicinal: Included in many heart complaint medications. Should only be used by qualified practitioners. Cultivars/Species: Approximately 20species of annuals and perennials. Annual species include: A. aestivalis, A. annua.